Do you know what that animal is? If you do, pat yourself on the back. 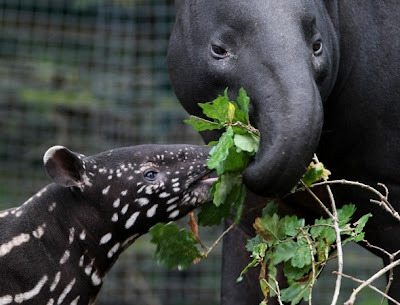 That's a baby Malayan tapir that was born at the Port Lympne Wild Animal Park in England. If you ever want to have a good time, stand in front of a tapir exhibit at the zoo and watch people try to guess what it is. (For some reason zoo visitors never read the signs.) 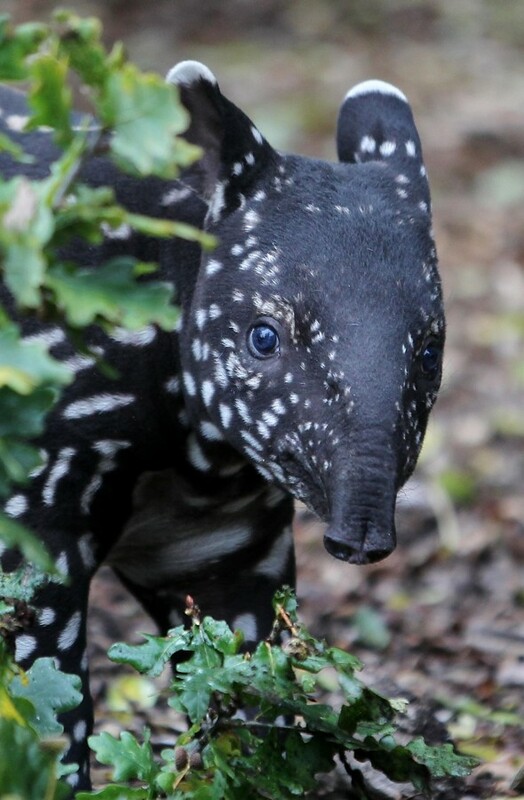 The tapir has been described as looking "like the result of a night of passion involving a pig and an anteater," but it's not closely related to either. Prehistoric tapirs ranged all over Europe, Asia, and the Americas, but the only species left are this one in Asia and four in South America. Their closest living relative isn't any of the things you'll hear those zoo visitors guess - it's actually the rhinoceros. And check out that first link to Port Lympne for an adorable video clip of the baby whistling and wiggling its snout. 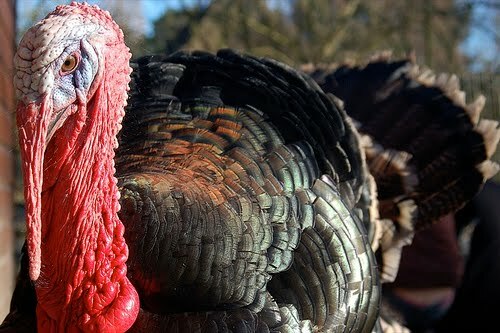 Sure, turkeys are delicious. But let's not forget how ugly they are. And read more about their ugly behavior at my other blog. Giving thanks to Flickr users Drome and Mark Coleman. Is this the legendary chupacabra, finally captured alive? Wow, it's a lot cuter than I expected. 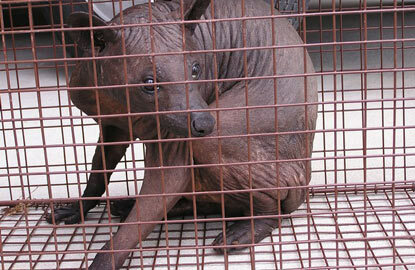 No, it's a hairless raccoon, found last week in Vero Beach, Florida. An officer of the local humane society says that the animal doesn't have mange or any other signs of illness. Apparently it's just a natural mutation, like the Sphynx cat or those hairless guinea pigs. And like those, isn't there something strangely appealing about it? This wrinkled boy was found trapped in a trash can by sanitation workers, who called animal control to rescue him. There'll be no more dumpster-diving for this guy: From here on in it's room service, at a wildlife sanctuary located in the town of Jupiter. Seems like a fitting destination for this alien-looking critter. 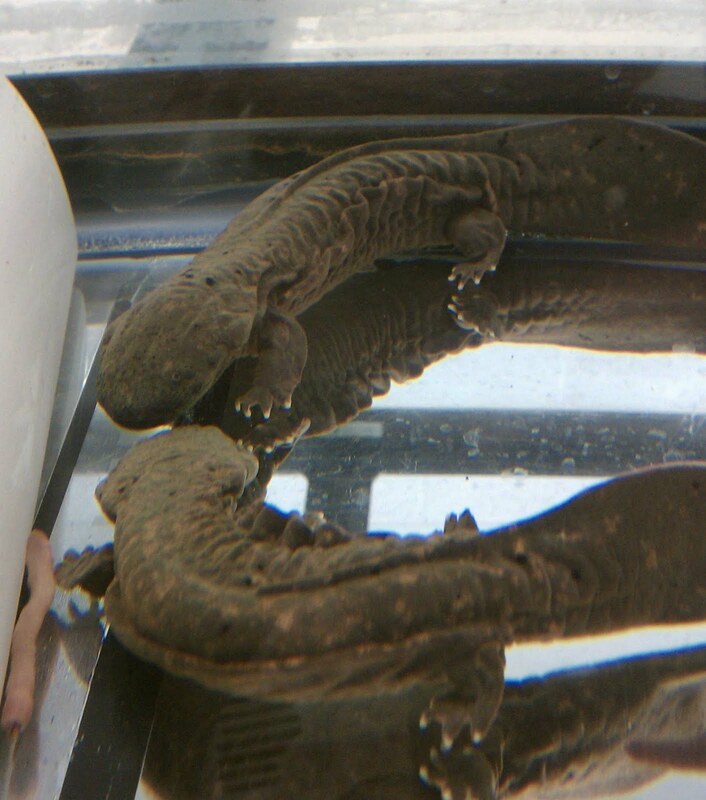 Today I met these young hellbenders. Aren't they cute? Look at their beady eyes and wrinkles! Look at their tiny little toesies! These guys are about two years old and maybe eight inches long. I'm not sure, I was too busy squealing to measure them. Adult hellbenders are about two feet long and look a lot like miniature Japanese giant salamanders, but live in the eastern United States. And they're colloquially called "snot otters." It doesn't get any better than that, right? When you're done cooing and squealing, read more at Hellbenders.org. 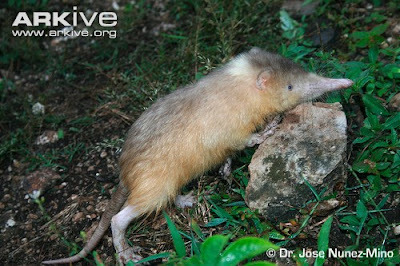 That is a Hispanolian solenodon. There are only two species of solenodon, and we haven't seen them nearly often enough here. 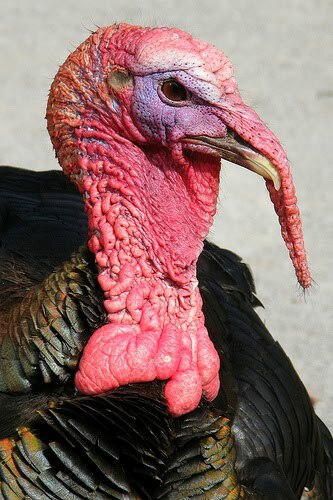 This is another animal that doesn't stop at being ugly to look at. That rubbery nose has got a ball-and-socket joint inside it for extra mobility. And if that's not weird enough for you, this is a mammal that is venomous. They've got toxic saliva that's delivered through grooves in their lower incisors when they bite their prey. They clean up pretty nice, don't they? 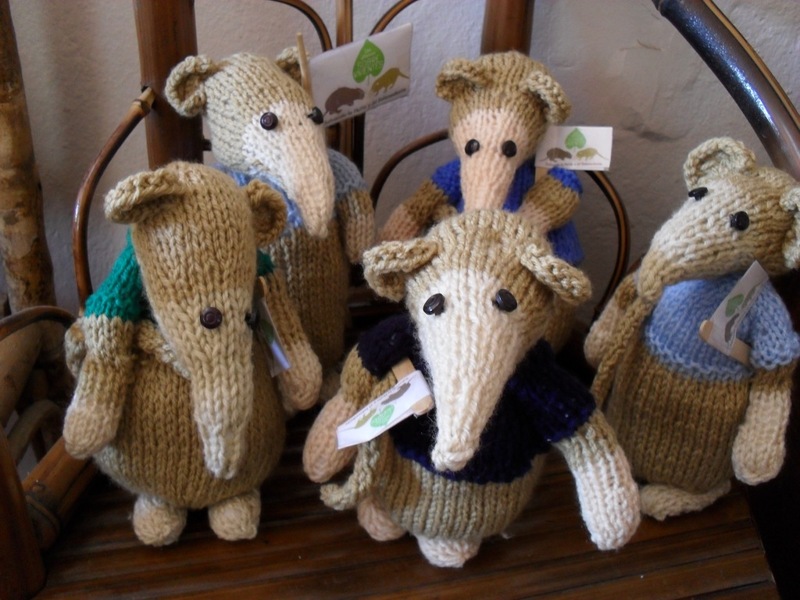 At least when you knit them out of wool with little t-shirts on them. Hey, if that's what it takes, I'm not going to argue. If they've captured your ugly-loving heart and you want to know more, you can read the blog and website of the group The Last Survivors for more about how they're trying to save the solenodon, and follow naturalist (and photographer of the above) Jose Nunez who tweets as Solenondon_Joe. Usually when I learn of an ugly animal event, I make a note to post when the day comes around. But there's no way I can wait till March to tell you about the Annual Return of the Buzzards to Hinckley, Ohio. In 1957, Walter Nawalaniec, ranger for Cleveland Metropolitan Park System (now known as Cleveland Metroparks), told a newspaper reporter that on March 15 he had witnessed for six straight years the turkey vultures returning to Hinckley Reservation. The Cleveland Press printed the story on February 15, 1957, and one month later on March 15 at 2 p.m. the first buzzard was spotted by 9,000 buzzard enthusiasts. Since then, over a hundred-thousand visitors have witnessed the return of the buzzards to Hinckley Reservation. The event has developed into an entire ugly bird festival, with nature hikes, presentations, live music, an Official Buzzard Spotter in charge and a big Buzzard Scoreboard. Sounds like spring break to me! Photo from the 2008 event by Flickr user rcoss2001. Check out his photostream for many pictures of the patience and devotion of ugly animal lovers on a cold foggy morning. 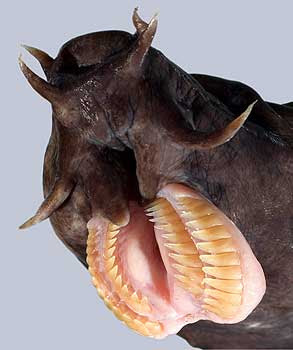 A commentor on the Hagfish Day post lamented that the photos of this animal never did it justice. I think we may have finally gotten one, don't you agree? Other footage gathered by the scientists showed that hagfish, usually thought of as scavengers, are pretty nasty predators too. Yes, as we've noted before, they swim inside of carcasses and eat their way out, actually absorbing nutrients through their skin. But they also hunt, using those retracting dental plates in the photo to grab and start swallowing prey, then waiting for it to die before they finish. They might use their slime to suffocate it to hurry the process along, too. Join me in saluting the brave souls who can spend enough time with hagfish to discover all those astonishingly repulsive facts.